Boston Dynamics is no Geppetto and PETMAN no Pinnochio, but someone must have wished on a phosphorous flare—decked out in chem-resistant camo and a dystopic gas mask, this robot couldn’t look more human. 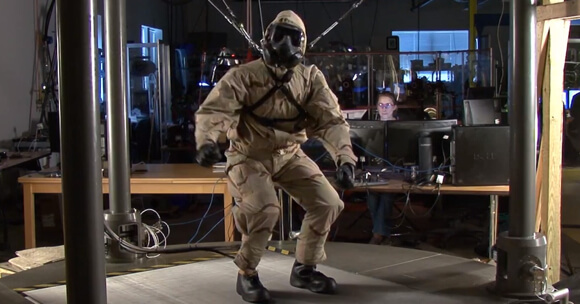 Boston Dynamics is building the bipedal PETMAN (Protection Ensemble Test Mannequin) for the Defense Advanced Research Projects Agency (DARPA). The firm’s been putting the previously headless PETMAN robot through its paces for the last several years, teaching it to do push-ups, walk, stretch, squat, and right itself when given a stout shove. PETMAN even perspires and regulates the temperature under its clothes to more closely simulate use by human soldiers. Though at first glance PETMAN appears to be braced by guy wires, it is self-balancing and only wired externally to draw power. Each new video shows off a more polished bot with a wider range of tricks. (See the latter two videos below for PETMAN’s evolution).